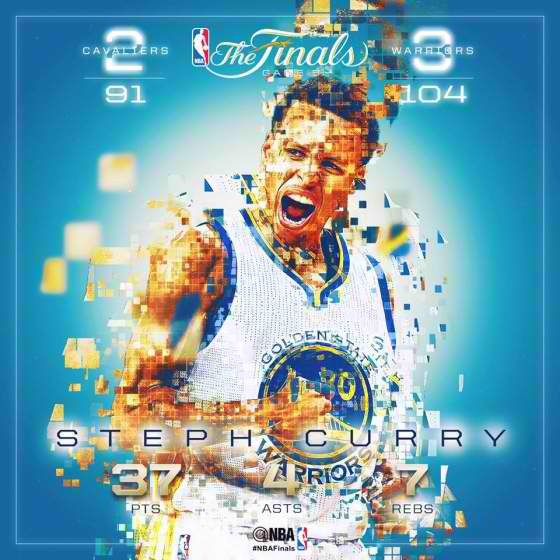 Warriors beat Cavaliers in Game 5, takes 3-2 lead in 2015 NBA Finals (Video Highlights, Top 5 Plays, Mini-movie) - Balita Boss! The Golden State Warriors made it two wins in a row, beating the Cleveland Cavaliers 104-91, Sunday night at the Oracle Arena in Oakland, California, to take a 3-2 lead in the best-of-seven 2015 NBA Finals series. Season MVP Stephen Curry was on fire, made seven 3-pointers and finishing with 37 points, seven rebounds, four assists and two steals. Four other Warriors players scored in double figures - Draymond Green had 16 points and nine rebounds, Andre Iguodala added 14 points, eight rebounds and seven assists, reserve Leandro Barbosa scored 13 and Klay Thompson scored 12. LeBron James, the self-proclaimed best player in the world, had 40 points, 14 rebounds and 11 assists in the second-highest-scoring triple-double in finals history. Tristan Thompson registered 19 points and 10 rebounds, while J.R. Smith had 14 points in addition to seven boards for Cavaliers. The Golden State Warriors moved one win closer to attaining the 2015 NBA Finals title. Game 6 will be Tuesday night in Cleveland (Wednesday morning in the Philippines) with the series set to return to Oakland if a seventh game is needed.